Welcome to Against All Odds: Super Bowl LIII! From the opening weekend of the NCAA football season through Super Bowl LIII, Mike Drakulich (PSN), the man behind Pittsburgh SportsNation, takes on his father, Michael J. Drakulich (MJD), in picking NCAA and NFL games against the Vegas spread. All good things must end! It doesn’t seem that long ago we started the Against All Odds 2018-19 season, but yes, it’s true… August was five months ago! It was an up and down season for myself, but I did register a perfect week of 10-0, and one 9-1 offering. As usual, the Bowl Season absolutely destroyed what could’ve been a very good year. Dad started off slow, but eventually chipped away until suddenly he couldn’t lose a game, especially during the Bowls… so for the 3rd time in four years, he is the Against All Odds Champion for the year. With one game left, he has a solid record of 96-85, good enough to whack me by eight games. Thanks to the Pittsburgh Steelers not making the playoffs, despite the overwhelming amount of talent they possessed, I haven’t done a Game Preview in a month, and I have an itch that can’t be left unscratched until next August, thus, with this Odds Finale, I’m adding a Super Bowl LIII Preview to boot! Until next we meet, be sure to check out my up and coming weekly commentary columns! Thank you for joining us for the ride and your support, but most of all, congratulations to my dad, Michael J. Drakulich, the 2018-19 Against All Odds Champion! Just when you thought the Patriots were dead… like Michael Myers, New England appeared like they were headed for greener pastures, especially after they lost to the Pittsburgh Steelers in week 15 by a 17-10 score. The loss was their third in five games. Tom Brady seemed lost. Star tight end Rob Gronkowski looked finished. Like Michael Myers, they returned with a vengeance. Four wins later, the Patriots find themselves in their third straight Super Bowl, hopeful to win their 6th Title, and tie the Steelers for the most in NFL History. The Los Angeles Rams have looked like a championship contender all year. With a young, brash coach in Sean McVay, a high powered offense featuring star dual threat Todd Gurley, and an opportunistic defense, LA lived up to the hype and secured their third Super Bowl appearance in Rams history, albeit with tons of scrutiny, thanks to the NFC Championship game against the New Orleans Saints. Somehow, the refs in that game missed one of the most blatant pass interference calls in history, a call that would have 99.9% sent the Saints to Atlanta instead of the Rams. But, as they say, it is what it is. The call wasn’t made, and the Rams were able to force the Saints to kick a field goal with 1:41 left. The Rams, with time running out, drove downfield and tied it with 15 seconds left. In OT, Drew Brees threw an interception which the Rams turned into a 57 yard FG to send them to the Super Bowl. It was a crushing defeat for the Saints, especially with the no-call, but then again, so were the two horrible drive continuing calls against the Steelers in week 16, both of which led to touchdowns after the Steelers appeared to stop them on 4th down. Those calls likely kept Pittsburgh out of the playoffs. Enough about the “what ifs”… let’s talk Super Bowl LIII. Aaron Donald, the all-world defensive lineman from Pitt, knows what the recipe for success is against the Patriots. And what if it’s Tom Brady time, late in the game where the Rams need a big stop? Gurely knows how much Donald turns it his game-play late in games, as evident by recording 9.5 fourth-quarter sacks in 2018. The Rams have a balanced attack, and plenty of weapons in the passing game. Super Bowls are won with big plays, plays that become immortal as time passes. Every player dreams of being the one who made the play that lead his team to a Lombardi Trophy. 41 year old Tom Brady hopes to make a few more of those plays, too. It’s going to be a fun game to watch between the Patriots and Rams, very likely a high scoring affair, like we witnessed in both Conference Championship games. The key for the Rams is pressure on Brady and being aggressive in the secondary. The Patriots will be balanced with their attack, trying to establish Sony Michel early, and using the Rams aggressiveness against them with passes to James White out of the backfield, and short, crisp passes to Julian Edelman, Chris Hogan, Phillip Dorsett, and Cordarrelle Patterson. Don’t sleep on Rob Gronkowski, either. He may not be what he was years ago, but he may conjure up one final performance to remember before calling it a career. The Rams will feature Todd Gurley as much as they can, with C.J. Anderson being available if Gurley’s injuries start nagging him. Jared Goff has a bevy of weapons to play with in the passing game, including a pair of 1,000 yard receivers in Robert Woods and Brandin Cooks. Cooper Kupp and Josh Reynolds will wreak havoc all over the field if not properly covered. Gerald Everett and Tyler Higbee give Goff two big targets at tight end. That said, you know Patriot’s head coach Bill Belichick will have some type of game-plan set to disrupt the Rams offense. Question is, how long will it work and what adjustments will the Rams and McVay make to counter it? I like this one to go back and forth, especially late in the game. I think the Rams are the better team, top to bottom. The biggest question will be how well Goff handles the pressure of playing in the biggest game of his life, on the NFL’s biggest stage. New England leads the overall series vs the Rams 8-5. Streak: New England has won previous five meetings. Post-Season: New England is 1-0 vs the Rams in the post-season. The New England Patriots, with a win, will tie the Pittsburgh Steelers (6) for most Super Bowl wins in NFL history. They are currently tied with Dallas (5) and San Francisco (5) with five Super Bowl wins. Conner needs 33 receiving yards to tally 500 in 2018. Antonio Brown needs one touchdown catch to reach 75 in his NFL career and with the Steelers. A look at the New England Patriots! Tom Brady may not be the version of himself five years ago, but he still has the goods to shred you to pieces if you allow him the time to throw. He has 4,355 yards passing, with 29 TD passes and 11 interceptions this season. He has been sacked 21 times. Sony Michel is the lead back for New England, amassing 931 yards on the ground with six touchdowns. James White is a dual threat, doing much of his damage catching passes out of the backfield. He leads the team with 87 receptions, good for 751 yard and found the endzone seven times. They may not be world beaters, but Julian Edelman, Chris Hogan, Phillip Dorsett, and Cordarrelle Patterson use their skills to get open, catch passes, and find extra yards when called upon. Edelman is Brady’s top choice at wideout, catching 74 passes for 850 yards and six scores. Be wary of Patterson out of the backfield, as he has 228 yards rushing and a score in 2018-19. Rob Gronkowski is a shell of what he used to be, but with this likely being his last game, maybe we’ll see one more stellar performance out of him. Battling injuries all year, he’s only collected 47 catches for 682 yards and three TD’s. They’re not flashy, and they don’t get to the opposing QB too often, but they play takeaway quite well, with 18 interceptions and 10 fumble recoveries. They give up yardage, but get stingier as you get into the redzone, only allowing 20.3 points per game. A look at the Los Angeles Rams! Jared Goff is starting to make his presence felt in the NFL. This year he passed for 4,688 yards with 32 touchdowns and just 12 interceptions. He was sacked 33 times. Can he keep his focus in the biggest game of the year, on the NFL’s biggest stage? Todd Gurley can do it all, gaining 1,251 yards rushing with 17 TD’s, as well as 59 receptions for 580 yards and another four scores. He has been plagued with the injury bug since late in the season and will have to summon up one more big game before rehabbing his injuries in the off-season. C.J. Anderson has played great when called upon. He has 299 yards on the ground with two scores, most of that coming in the last four games after the Rams picked him up off waivers. Robert Woods leads the team with 86 catches and 1,251 yards receiving. Six of his receptions have ended up as scores. Brandin Cooks is the speedy outside guy with 80 receptions, good for 1,204 yards and five TD’s. Cooper Kupp and Josh Reynolds can wreak havoc all over the field if not properly covered. Gerald Everett and Tyler Higbee form quite a duo, combining for 57 catches and 614 yards between them. 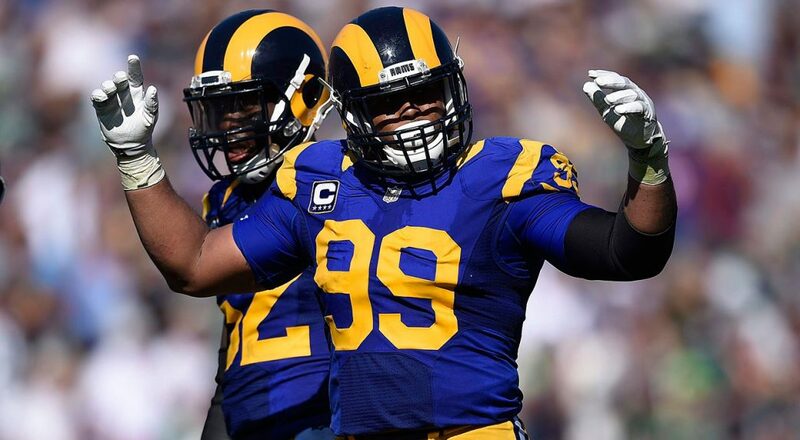 The Rams front line with Aaron Donald and Nadamukong Suh create chaos every snap. Donald is on his way to a Hall of Fame career, as an almost unstoppable force. He has 20.5 sacks this season. The Rams don’t give up many yards, but they are susceptible to giving up big plays now and then. They are giving up 24 points per game. They’ve sacked the opposing QB 41 times and have collected 18 interceptions.